Along with minimalist strength training is a form of training similar in terms of benefits for both health and aesthetic reasons called interval or sprint training. Along with minimalist strength training using interval training can actually help you to “burn fat while you are sleeping”…how’s that for a sweet benefit? As the name implies, a sprint workout has you working very hard for a brief period of time and then mixing in active rest periods between each working interval. The idea is to push 110 percent during the work interval and back off to allow for a rest period to occur so you are able to recover and can repeat the process of pushing hard once again. Any form of cardio training medium such as uphill sprinting or cycling that allows you to get up to top speed quickly is perfect. The main point is you can’t take too long to get to top speed otherwise your “interval” will be nearly over by the time you get there. You can also choose to use bodyweight conditioning exercises to do your interval/sprint training. Any series of burpees, mountain climbers, squat umps, lung jumps and so on which helps to work multiple muscle groups and gets your heart rate up and pumping are ideal. 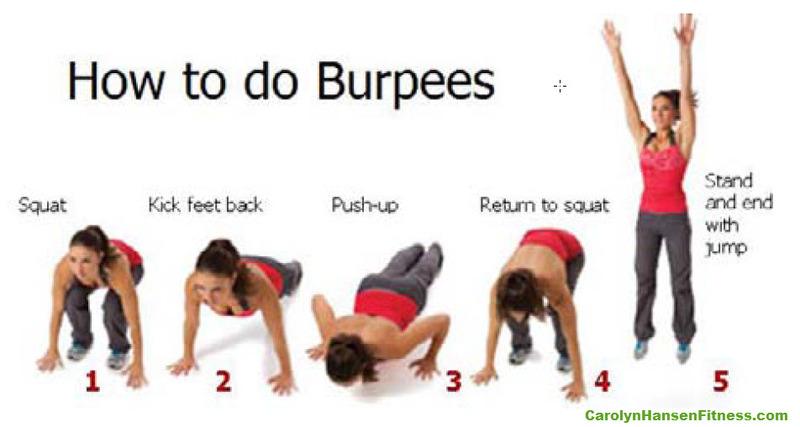 Burpees are an ideal exercise for your interval workout. 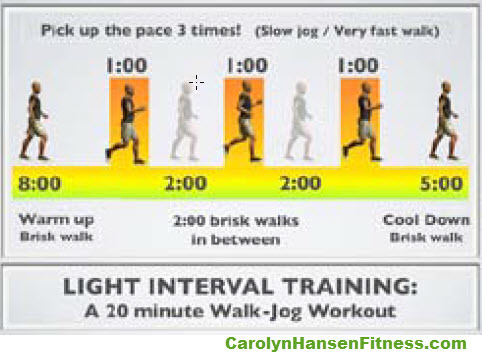 The work intervals for this type of training should last between 30-60 seconds with the shorter the interval being done, the higher intensity being seen. Pair this with an active rest interval of 60-120 seconds (basically twice the length of the work interval. Repeat this set-up 5-10 times to form the complete workout. Start with a 5-8 minute warm-up and finish with a 5 minute cool-down. Burpees make nearly everything burn from your muscles to your lungs and most importantly, a ton of calories. They require you to go from pushup position to a jump and back to a pushup position again. Because they are so tough to do, performing about 10 reps can boost your metabolism as much as a 30 second all out sprint. Despite how hard they are to perform, burpees continue to rise in popularity for a good reason…they are one of the most effective, functional exercises you can perform. Unlike other exercises like bicep curls, burpees are full body exercises meaning you’ll include nearly every muscle in your body while doing them causing you to burn more calories in less time. Put some quickness and real intensity in while performing and you’ll enjoy even bigger calories burning effects that last all day long. Just by adding this one workout protocol into your exercise routine once per week can bring about great gains in your fitness level and health level.